We also carry a wide selection of Green Killing Machine Replacement Lamps and Green Killing Machine Replacement Parts. 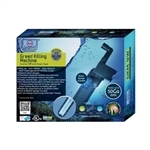 The Green Killing Machine 3W Internal UV Sterilizer with Power Head is for aquariums up to 20 gallons. The Machine has a unique patented technology that allows the water flow to have direct contact with the UV lamp, making it extremely efficient. Keep your aquarium crystal clear & reduce water changes. It includes the pump and takes only 5 minutes to install (no tools required). The Sterilizer and pump are submersed completely in the aquarium and are attached to the inside of the aquarium with the included suction cups. The Green Killing Machine 9W Internal UV Sterilizer with Power Head is for aquariums up to 50 gallons. The Machine has a unique patented technology that allows the water flow to have direct contact with the UV lamp, making it extremely efficient. Keep your aquarium crystal clear & reduce water changes. 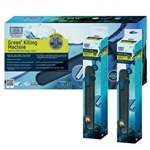 The Green Killing Machine 24W Internal UV Sterilizer with Power Head is for aquariums up to 120 gallons. The Machine has a unique patented technology that allows the water flow to have direct contact with the UV lamp, making it extremely efficient. Keep your aquarium crystal clear & reduce water changes. Along with the 9W Sterilizer this package includes two replacement bulbs (there is another bulb with the UV). These UV bulbs lasts for 6 to 9 months, assuming constant use. Along with the 24W Sterilizer this package includes two replacement bulbs (there is another bulb with the UV). These UV bulbs lasts for 6 to 9 months, assuming constant use. 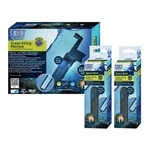 The Green Killing Machine 3W Clip-On UV Sterilizer is for aquariums up to 20 gallons. Unlike the other Green Killing Machine UVs, this one does not have a integrated pump. It's designed to clip on to the waterfall output of a power filter. This is the easiest UV Sterilizer on the market to install. The Machine has a unique patented technology that allows the water flow to have direct contact with the UV lamp, making it extremely efficient. Keep your aquarium crystal clear & reduce water changes.